Monkshood (Aconitum spp. ), a highly poisonous plant, is one of the best perennial flowers for cold climates. Its electric blue to deep purple blossoms give new meaning to the notion of 'bold colors'. All parts of monkshood are very poisonous to people and pets - do not ingest it. The sap from the plant is also dangerous as the toxins can be absorbed through the skin, so it's important to wear gloves and protective clothing when working with monkshood. The name Monkshood is a reference to the hood-like shape of a medieval monk's robe. The three to five foot stalks of this perennial are covered from top to bottom with the one inch hood-shaped flowers, which on some varieties can be such a dark purple color that they appear black. 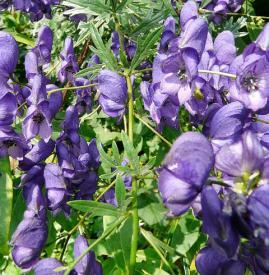 There are other, lighter shades of monkshood available as well. The foliage is finely divided and has an almost claw-like appearance. It emerges from the ground each spring, forming a clump just a few inches tall before the flower stalks rise in summer. Monkshoood's primary flowering period is from late summer through early fall. Monkshood is a long-lived perennial, but has no tolerance for heat. Grow it in USDA zones 3 through 7 where summer nights are relatively cool. 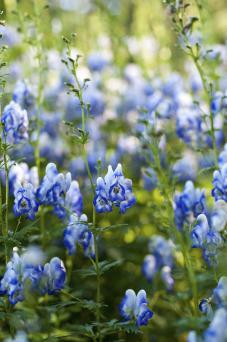 Monkshood needs rich, moist soil to thrive, but it should be well-drained. Full sun is fine in cool, montane or coastal areas, but partial shade is best on the warmer end of its range. The primary use for monkshood is in perennial borders. Its height makes it suitable for the mid-ground of border plantings, where low-growing plants can obscure the base of the plant and taller species can rise from behind it. Preparing the soil is the first step to successfully growing monkshood. Spread a two to three inch layer of compost over the planting area and work it into the soil to a depth of at least six inches prior to planting. If drainage is poor, consider raking the planting area into a low mound to prevent the topsoil from becoming waterlogged in periods of heavy rain. Plant Delights Nursery, Inc. offers small pots for under $20. BulbsDirect.com offer packages of three plants for $13. The roots are very brittle and prone to damage, so be gentle as you loosen them during transplanting. Water - Monkshood needs weekly water whenever that has not been a soaking rain. The taller varieties may also need staking when they start to flower to prevent them from toppling over in the wind. Mulch - Spreading a layer of compost as mulch each fall will promote luxuriant growth and abundant blossoms each year. Applying a layer of mulch once the plants have started growing in spring will help to conserve soil moisture and keep the roots cool during summer. Division - It's helpful to divide clumps of monkshood every three or four years to ensure the roots have plenty of space to grow. Fall is the best time to do this and is generally the best time to plant monkshood, as stress to its sensitive roots will be minimized. Monkshood is resistant to most pests, but is prone to a variety of fungal diseases, including bacterial leaf spot, powdery mildew, root rot, and verticillium wilt. These are all exacerbated by poor drainage and extremes of heat and humidity. Trying to grow monkshood in places with hot summers is almost certain to result in one of these diseases. 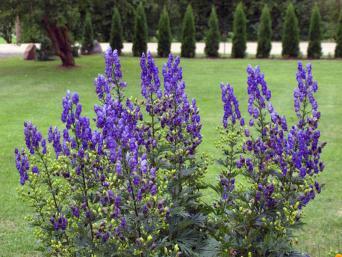 Several colorful cultivars of monkshood are available, all of which are best suited to USDA zones 3-7. 'Newry Blue' is one of the many classic dark blue cultivars, growing four to five feet tall. 'Albus' has pure white flowers on plants three to four feet tall. 'Rubellum' has pink blossoms and finely divided foliage. 'Bicolor' is a robust blue and white cultivar growing three to four feet tall. 'Ivorine' is an unusual creamy white dwarf variety growing only one to two feet tall. Monkshood has a long history of folkloric use, mostly linked with its lethal properties. Another common name for the plant is wolfsbane, a reference to its use in medieval times as a wolf poison. It was also traditionally used in hunting to make poison arrows. Numerous mythological characters have used the plant for a mixture of murderous and magical purposes, including Hecate and Medea. Gardeners in extremely cold climates have such a limited palette of plants available to them, making a species like monkshood a major asset. It has the classic cottage garden look and comes in a wide variety of colors in addition to the original, captivating purple and blue forms.